Cinco de Mayo (or Fifth of May ) is also known as El Dia de la Batalla de Puebla (The Day of the Battle of Puebla) and is celebrated in Mexico and the United States. On this date in 1862, the Mexican Army defeated the attacking French forces (which were twice as large) after the French invaded Mexico in 1861 at the Battle of Puebla. Their victory was short-lived, but with the U.S. on Mexico’s side, the French began their retreat in 1866. Mexican President Benito Juarez began establishing a government a year later, in Mexico City. The making of paper flowers has been associated with this holiday for years. 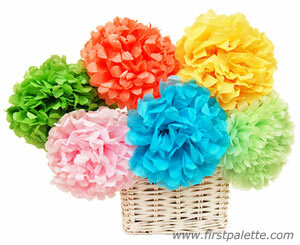 Here’s a great link to make Mexican Tissue Paper Flowers for Cinco De Mayo!